~RED CANYON RANGE CAMP ~ "The most godforsaken camp and best place to work in the USA." Early in the 1950's Cold War, the US Army's continental antiaircraft defense against long range Soviet bombers consisted of tube guns, i.e. cannons. In 1953, the first guided missile antiaircraft system, Nike Ajax, became operational and the guns slowly began to be replaced by the supersonic missiles. Many gun people were not happy about the changeover. Training for the Nike Ajax system was conducted at Fort Bliss, near El Paso, Texas. Following graduation from the brand new Air Defense Artillery School, the class, called a Package, took their Nike equipment 165 miles north to Red Canyon Range Camp and fired several Nike Ajax missiles at target drones. After firing, the Package was deployed to an operational site near a large metropolitan or industrial area. Nike sites also guarded Strategic Air Command (SAC) bomber bases. Eventually there were hundreds of Nike sites throughout the nation. Once a year, each operational Nike site returned to Red Canyon to fire three missiles as a continuing training and evaluation exercise. 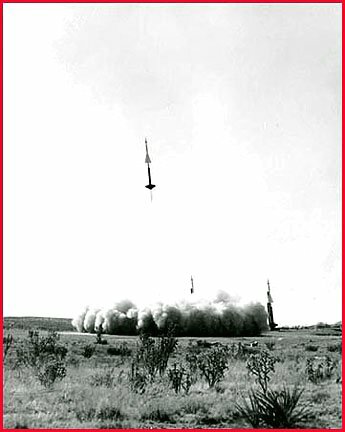 Red Canyon Range Camp was only a temporary firing range for the missiles. Located 15 miles west of Carrizozo, New Mexico, it was on the side of the Chupadera Mesa in the northeast corner of the vast White Sands Proving Ground complex operated by the US Army Ordnance Corps. No one expected Red Canyon to be needed more than two years until a suitable firing range could be built nearer Ft. Bliss (McGregor Range). Being designated a Camp meant no funding was available for permanent buildings, everything had to be procured through the Ft. Bliss Salvage yard or scrounged. With little or no support from senior ex-cannon officers at Ft. Bliss, Red Canyon was left to fend for itself. Many at Ft. Bliss referred to it as The Gulch, out of sight and mind. Red Canyon was a thorn in the side of both Ft. Bliss and White Sands. That changed overnight on October 4, 1957 when the USSR launched the world's first artificial satellite, Sputnik 1. Sputnik was a political shot heard around the world. Suddenly the US felt vulnerable. The mighty oceans were no longer a safety net for our country. Immediate protection was needed and Nike Ajax was it. In less time than it took Sputnik to orbit the earth, Red Canyon went from being The Gulch to an "A" Ticket. General officers, VIPs and foreign dignitaries began visiting the camp on a regular basis to examine this new-fangled missile system. Would Nike be suitable to protect their constituency? Special tours called Operation Understanding (OU) were conducted weekly at the camp. Support for Red Canyon became a very high priority at Ft. Bliss and the Pentagon. After more than six years, the "temporary" camp closed for missile launches in August 1959. A crew of 53 men stayed on until circa Nov. 1960 to remove all permanent structures except the chapel. Thousands of soldiers and civilian VIPs had been through the camp and more than 3,000 Nike Ajax missiles had been launched. Without a doubt the Army got its money's worth from the insignificant little temporary missile firing range called Red Canyon Range Camp. This website is dedicated to the men who lived and worked at the camp. We experienced the hardships of living in a migrant workers' camp and the thrill of launching the world's first supersonic antiaircraft missiles. I would not trade either for anything in the world. Tours are best viewed with a monitor resolution of 800 X 600. Higher resolutions will significantly reduce photo sizes. MAIN CAMPTour the area where we lived. DOWN RANGETour where the Nike Ajax missiles were assembled and launched. NEW PHOTOSTour a gallery of RCRC vets in recent photos. FINAL PHOTOS Tour the camp as it is dismantled in 1959. SPECIALTour important stuff that does not fit the other categories. OSCURA RANGE CAMPGreat information on RCATS and their operation. LINKS PAGELinks to related and interesting websites. Webmaster InfoInformation about JP Moore.